With the apparent aim of boosting its services business, Nokia has made some changes to its organizational structure and had a consequent reshuffle of its executive team. The most significant change is the separation of the services part of the Mobile Networks business unit into a new one called Global Services. The previous head of Mobile Networks, Samih Elhage, has chosen this moment to leave the company, possibly indicating displeasure at the pillaging of his business unit, although that’s not how Nokia is spinning it, of course. Marc Rouanne, currently Chief Innovation and Operating Officer, will become President of the newly emasculated Mobile Networks business group. The CIOO role is also being split up, with a regular COO role restored and given to Monika Maurer, and innovation being CTO Marcus Weldon’s problem now. Current EVP of Global Services Igor Leprince was the obvious choice to head up the newly enlarged Global Services group, having merely to remove the Executive Vice from his job title. Nokia isn’t the only networking vendor to shuffle things around recently. 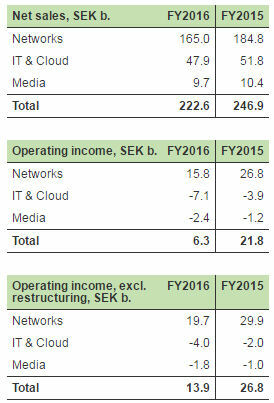 While Ericsson is still trying to work out what its strategy is, it has changed its reporting structure to split out its IT & Cloud and Media operations from the core networks stuff. As you can see from the table below Ericsson has yet to break even with its diversification efforts and the picture appears to be deteriorating. While Nokia’s reshuffle could merely be a case of making a virtue out of necessity following Elhage’s decision to spend more time with his golf clubs, it’s possible to discern some strategic rationale behind it too. Ericsson’s decision to split out two loss-making divisions seems more defensive and it’s worth noting that when Nokia split out its handset and navigation divisions it sold them not long after. Just saying.